Archbishop Sylvester, in the world Justin Lvovich Olshevksy, was born on May 31, 1860 in the village of Kosovno, Skvirsky uyezd, Kiev province (according to another source, he was a native of Poltava province), in the family of a junior deacon. In 1883 he graduated from Kiev theological seminary, and in 1887 - from Kiev Theological Academy. On March 7, 1889 he was appointed diocesan missionary for Kiev, and in 1890 - diocesan missionary for Poltava and teacher of history, pastoral theology, liturgics and homiletics in the theological seminary. He was also inspector of church schools and president of the diocesan council. On February 2, 1892 he was ordained to the priesthood as a celibate, and was appointed to serve in the cathedral church of Poltava. From October, 1892 to the end of 1896 he was teacher of the Law of God in the women's Sunday school in Poltava. From 1896 he was diocesan supervisor of the church schools of Poltava diocese. On May 12, 1902 he was raised to the rank of protopriest. On December 10, 1910 he was tonsured into monasticism and was raised to the rank of archimandrite. He took the name Silvester in memory of the well-known rector of the Kiev Theological Academy whose personal secretary he had been as a student. Fr. Sylvester was a spiritual writer. On January 16, 1911 (according to another source, 1910), he was consecrated bishop of Priluki, a vicariate of the Poltava diocese, in the Holy Trinity cathedral of the Alexander Nevsky Lavra by Metropolitan Vladimir of Moscow, Metropolitan Flavian of Kiev and other hierarchs. On November 13, 1914 (according to another source, 1913), he became bishop of Chelyabinsk, a vicariate of the Orenburg diocese. From June 4, 1915 (according to another source, from 1917) he was bishop of Omsk and Pavlodar. On the first day of Pascha, 1918 he was raised to the rank of archbishop. At the beginning of 1920 there was a tense atmosphere in Omsk. On the basis of the decree on the separation of Church and State the local Bolsheviks had demanded of Archbishop Sylvester that he hand over the whole administration of the consistory, together with the building, the equipment and the property, into their hands. They also demanded that he clear out his residence so as to make way for Bolshevik institutions. On that day there was a triumphant service in the new cathedral. Protopriest A. Solovyev gave an exalted sermon full of feeling on the persecutions against the Church. He himself wept, and the parishioners wept. On February 3, a Saturday, groups of parishioners began to gather round the church. They were dispersed by Red Army soldiers. A cross procession had been appointed for the next day. Emotions were running high. The epistle of Patriarch Tikhon was read. However, no serious conflict had yet taken place. On the night of February 6 an armed detachment of sailors from a punitive squad went up to the archbishop's house and began to knock on the doors. In view of the robberies and violence caused in the city at night under the guise of searches, the servant did not open the doors. The sailors began to threaten that they would shoot and break down the doors if they were not opened, and in fact they did begin to break them down. Then at the command of the steward of the archbishop's house they began to sound the alarm on the cathedral bells. The detachment ran away. A short time later they again began to knock on the doors. To the question: Who are you? they replied that they were parishioners. The cell-attendant opened the doors. It was the Red Army men. When the cell-attendant tried to usher the uninvited guests out of the door, he was killed with a bullet from a revolver on the spot. They seized Archbishop Sylvester, pressing a gun to his temples, and without giving him the opportunity to put on warm outer clothing, led him through the Siberian frost through the whole city to the "House of the Republic" - the Sovped's headquarters. Before leaving, the leader of the detachment shot the archbishop's steward, Nicholas Tsikurye, blowing out his skull with what was probably an explosive bullet. Archbishop Sylvester was placed in a dirty room filled with tobacco smoke. In the same room were Protopriest Fr. Alexander Solovyev and the cathedral sacristan, Fr. Theodore Chelyugin, who had been arrested earlier. On February 5 the priest of the church of the Peter and Paul hospital, Fr. I. Chokoy, was arrested for not serving a pannikhida for the Red Army soldiers. Fr. Chokoy refused to sign the protocol of the president of the investigatory commission. 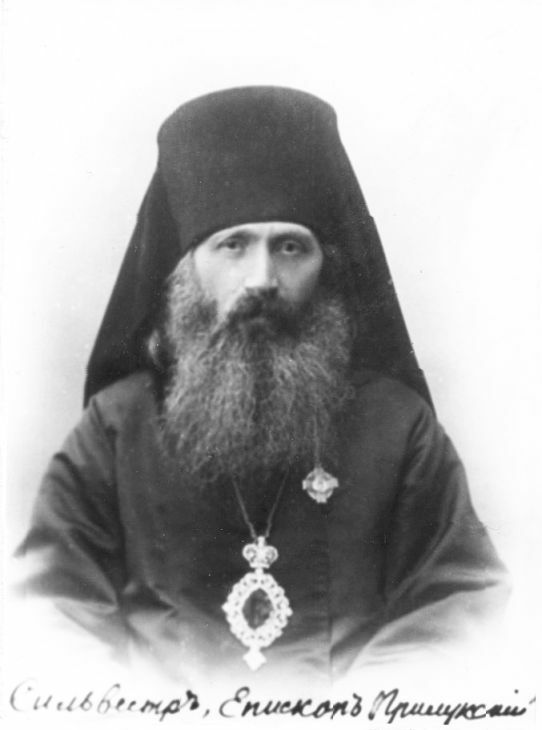 On February 26, 1920 (old style), Archbishop Sylvester died in prison in Omsk after enduring many sufferings.